As if it’s not bad enough that the world eats Islam’s propaganda for breakfast everyday. What’s even more unimaginable is how the West spoon feeds it’s people a totally false scenario about this enemy. An enemy that has sworn to annihilate them and backs it’s rhetoric up everyday of the week – just read the headlines. The most lethal example of the West’s, and indeed most of the civilized world’s ignorance and gullibility is their understanding of Islam. 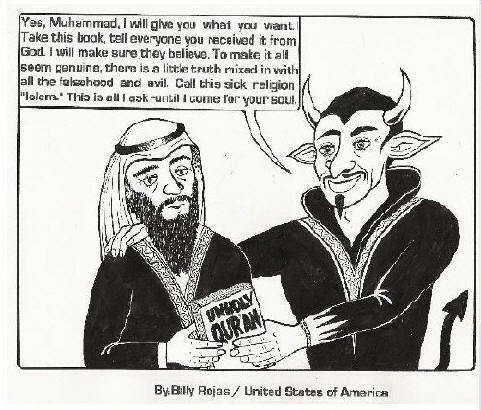 God forbid that they actually pick up a copy of the Koran or Hadith and read about what in fact IS Islam. It’s all contained in these two books which are the Bibles of the Islamic world. There is only one Koran and only one Hadith. There are no different versions on which any dispute as to their content actually says. There is only one Islam, the Islam of Mohammed and Allah. The following article is not a revelation or groundbreaking news. The Imams and their like have been telling the West this for hundreds of years but the suicidally ignorant West refuses to take them at their own word despite their daily actions that horrifically show that they mean what they say! The Middle East Media Research Institute posted an excerpt of a Hamas television interview with Dr. Subhi Al-Yazji in which he decried “biased media outlets” for promoting the brainwashing and poverty explanations for the terrorism phenomenon. Al-Yazji referred to attacks against Israelis as “martyrdom operations” not terrorism.